Melting snow gives way to hidden trailheads along the Cascade mountainside. Visitors can find multiple hikes within a 20 mile radius of Cle Elum, all showcasing picturesque mountain panoramas, bright wildflowers, towering pines and native animals. While there are many to choose from, these three hikes showcase a variety of trips for every kind of hiker! This 5.1 mile trail takes visitors on a tour of the native flora and fauna that fills the Cascade mountainside. 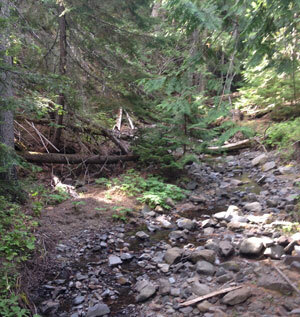 This trail hugs the gurgling creek and is shadowed by tall trees, allowing for a convenient summer hike with little ones. Be sure to bring binoculars and a camera -- this is a local favorite for bird watching! The Teanaway Ridge Trail is lightly trafficked and full of wildflowers in the spring. At 5 miles with a moderate skill level, most hikers will find themselves breaking a sweat and breaking out the camera -- pine-studded hillsides and forest animals will surely take a hiker's breath away! This trail is equally rewarding as it is challenging. Plan on an initial steep climb, tree-covered pathways and a culminating panorama of the Cle Elum Valley, snow-capped Mount Stuart and a sneak peeks of the Yakima River. The wind can be brisk at the top of the ridge, so bring a jacket and enjoy the landscape.